This limestone-clad, 13-story structure is one of the most exclusive and elegant buildings on the avenue because of its very fine detailing and that the fact that it has only 6 apartments. Exquisitely designed in Italian-Renaissance-palazzo-style by Rosario Candela and the firm of Warren & Wetmore, this building has a sidestreet entrance and attractive landscaping. 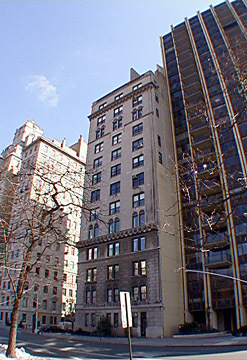 It was built in 1927, a year after the similar and equally handsome building directly across 80th Street was completed to designs by J. E. R. Carpenter, Candelas predecessor as the preeminent designer of luxury apartment buildings on the Upper East Side. This building was converted to a cooperative in 1952. All the apartments in this building, which has inconsistent fenestration, are duplexes and the penthouse is one of the nicest in the city. The buildings location is right in the middle of Fifth Avenues "Museum Mile" and across from the south end of the Metropolitan Museum of Art. It is also only a block away from cross-town bus service and is convenient to a supermarket on Madison Avenue as well as the charming outdoor café at the Stanhope Hotel on Fifth Avenue at 81st Street. 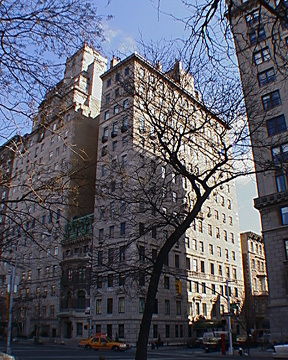 The building, which was erected on the former site of a François I chateau-style mansion designed by C. P. H. Gilbert for Frank W. Woolworth, has spectacular views of Central Park and a doorman but no garage and no health club.